Ukulele Cats are ukulele aficionados who get together to practice playing the ukulele in Sacramento. We sing! We play! We uke! Winter Jam: We often search for a winter location for ukulele practice since the demise of Coffee Garden. 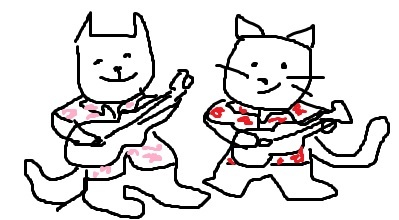 Summer Jam: Uke Cats meet for the summer in the McKinley Rose garden most Tuesdays sometime after 6pm until the mosquitoes attack. Toddlers either clap or run away from our enthusiastic amateur overtures. Bring your ukulele and join us! For other nearby ukulele strum-a-longs and workshops, check out the The Strum Shop in Roseville.